We’ve all seen the hashtag: relationship goals all over social media and in the mainstream (entertainment) media but, let’s face it, some of these “relationship goals” are not the best examples for us Catholics. Of course, every relationship is different since every person is unique, but it doesn’t hurt to have some examples of what a good, saintly relationship looks like. Enter, saintly relationship goals. Look at these four saintly couples who can teach us a thing or two about what a great relationship looks like. 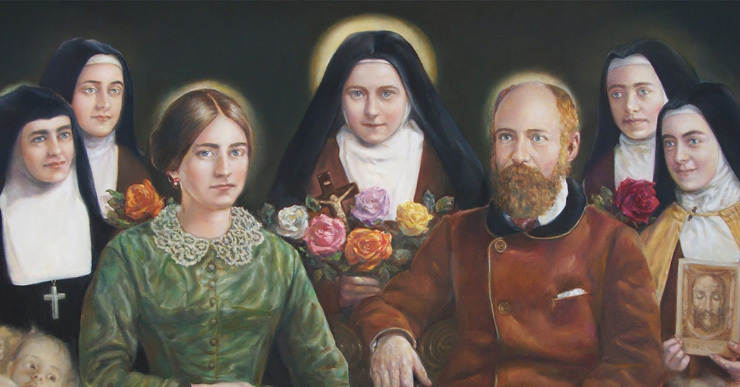 Saints Louis and Zelie Martin, parents of the Little Flower, St. Therese, were the first married couple to be canonized together. Both famously wanted to join religious orders, but God had bigger and better plans for them. It is said that when St. Zelie first saw her husband, she heard an interior voice say, “This is the husband I have destined for you.” He wanted to live a Josephite (read: chaste) marriage, which they did for the first 10 months of their marriage. She wanted a family she could give back to God. Eventually, their marriage produced 9 children; 5 of whom went on to consecrate themselves to God in two different religious orders. They brought up their daughters in a modest home despite being financially well enough and brought them up to trust and love God with their whole hearts. If this isn’t an excellent example of not only “relationship goals” but “family goals,” I don’t know what is. This couple of less known than the other couples but theirs was a beautiful marriage that produced many saintly children. He was a powerful landowner and government official… who happened to be pagan. She was his loving Christian wife who was responsible for his conversion. Together they became the parents of Saints Gregory Nazianzen the Younger, Caesarius, and Gorgonia who went on to glorify God’s kingdoms in their own ways. Though not many details about their marriage have survived, enough is known to look to them as an example of a holy Christian couple who exuded piety, charity, exemplary Christian values, and truly led their children to Heaven by their actions. The grandparents of Jesus and the parents of the Blessed Virgin Mary, St. Anne and St. Joachim faced trials before they were blessed with the birth of their daughter. Both lived saintly lives and were charitable even during those two decades when they were unable to have a child. St. Anne is often sought out by single young women who are looking for a husband and one can see why. St. Joachim was turned away from the temple by priests simply because he was childless. Still, he didn’t let that insult get him down and he continued his acts of charity and piety. You know this couple was a holy one since they were entrusted with the life and bringing up of our Blessed Mother. They are a great “relationship goals” couple for couples struggling with infertility as well as single young women trying to find their spouse. Talk about the ultimate “relationship goals” couple. The earthly parents (biological and adoptive) of Jesus exemplify what a relationship is all about. St. Joseph could’ve wiped his hands clean of Mary, his betrothed, when he found out she was pregnant… and not by him. Instead, he chose to stick around (after the angel explained the situation) and protected both our Blessed Mother and our Lord in more ways than one. He gave Jesus an earthly father figure, protected both him and his mother during their long and arduous journeys to and from Egypt, and even protected Mary’s perpetual virginity. While details of their domestic life are a mystery to us, I think we can safely assume that both willed the good of the other during their marriage until St. Joseph’s death. These are just four examples of the countless beautiful couples that have gotten each other to Heaven. Perhaps you know of a couple (e.g. your parents, grandparents, etc.) that also exude those qualities you’re looking for in your own future relationship and/or marriage. Look to them for examples of what a true, selfless, giving relationship and marriage is like; one that glorifies the vocation and God and not worldly goals that aren’t very holy and may doom you for eternity.